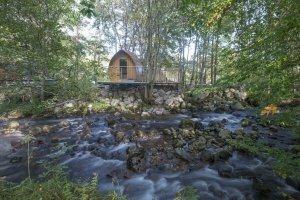 As the leaves fall from the trees and Jack Frost starts to lightly dust Glen Coe, many people say that Winter is simply the best time to visit RiverBeds. Wether you’re snuggling with #1 under the duvet or bubbling away in the hot tub listening to the river tumble below, it’s Netflix & chill season and now that our busy period is over we have a very special deal for you! Simply add £45 per night supplement if you want to stay over the weekend (Friday or Saturday night). This offer is valid from 28th October – 28th March excluding school holidays. We have a small number of lodges on offer which are likely to sell out fast, so please book ASAP to avoid disappointment. Savings are calculated using our standard website rates over this same period (average of £345 per night for a stay of 2+ nights). Look at the calendar below to find an available date (green dates are available, red dates are not). This is a static calendar to show availability so you can’t book on it – this is done through the booking form afterwards. Please enter your card details below to pay for your adventure.